This is how Day 2 of the conference began. Our instructions from Kate: Do not speak during the exercise; if you notice something in the room go to it and explore it; if you notice someone else noticing something, and you are compelled, go to it. Kate says something to the effect of, “you may find you end up moving as a collective, let’s see what happens”. At the end of the exercise – Kate turns to us and asks, “do we need to talk about it?” We all collectively and quietly agreed that we do not. So, having the task to review this panel I wondered whether I should review this bit, after all it was impromptu with Kate filling the space when Gareth Somers sadly couldn’t make it. Is it even fair to review it? And, should I not honour the ‘not talking about it’ position we immediately came to after the exercise? I do have penchant for rebelling…. I’ll tell you what I’ll do, I’ll write a poem about how I experienced the exercise. I rip the tape away; all hell breaks loose and we are none the wiser. So there’s that – the reminder of being an undergraduate, and how the experience or feeling might not be so different to being a performer trainer or teacher in 2018. Where is the place of art, creativity and expression within the training environment? Who has authority in the performer training studio? Where does performer training sit within the theatre, performance, dance, and drama canon and how comfortable is that seat? 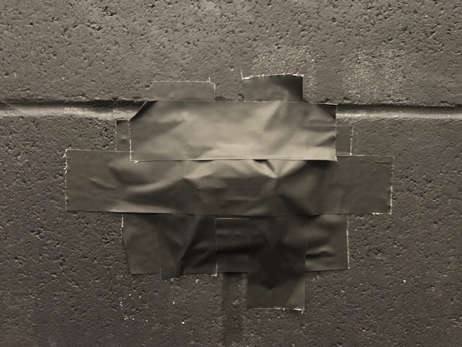 So, as we moved about the space I wondered if this exercise is a metaphor for all that we are questioning within the three days here at TaPRA and the fragility of our wider contexts – institutions and their hierarchies, schools of thought, and walls. For now, I am embracing the fragility. Another theme that emerges time and again in the performer training working group, and within wider performer training research, is that of the trainer/trainee relationship, and power dynamics within the training space. In her paper, Dana Blackstone describes and takes us through the thinking behind her ‘compassionate practices for communication, community, and potential sustainability in ensemble actor training’. The title of the presentation strikes the tone straight away, denoting this compassionate mode of practice – ‘What I see in you, that I see in me is…’. What struck me throughout the presentation was that though Blackstone was telling us of an exercise she sets for her students, the ‘I’ and ‘me’ included the facilitator, making way for a democratic space, an open space and indeed a truly compassionate space. In other words, the exercise didn’t just stop with the students – it encapsulated everyone in the space and therefore the space took on an identity of compassion in its own right. Though one could foresee initial difficulties students may have in critiquing their friends or other students they may want to make friends with, the framing of this exercise is what makes it work. It is a challenge that, once overcome, could promote a safe and honest space for creativity, collaboration and risk taking. It would be great if we could have this compassionate mode of practice in as many other walks of life as possible. The idea of cultural cannibalism is not something I expected to emerge from the performer training working group at TaPRA but now I can’t get the notion out of my head. In the context of performer training are we trainers not all taking part in cultural cannibalism by using/assimilating the work/practices/ideas of others – not to say that it is a bad thing (all the time at least). This flooding of my brain with these thoughts is thanks to Flavia Domingues D’Avila’s presentation ‘From Theatre Anthropology to Theatre Anthropophagy’. It seems that Domingues D’Avila here is interested in the in-between spaces, in the cross sections and the clashes that can sometimes exist, both in cultural landscapes and in performance/performative traditions. As someone interested in performer training, and as someone who has spent going on a third of my life away from the country where I grew up, many questions are raised for me listening to this presentation and when I think of these in-between places. How do we identify these spaces and by what/whose parameters and terms? What happens, notionally at least, when we take these parameters away? What affect might existing in these cultural crossovers have on one’s personal/national identity? And in view of all these questions; what do we disrupt, move, challenge when we ‘train’ the performer? A lot of these questions are asked from the perspective of my own interests and scholarship, however, Domingues D’Avila offered such interesting reflections in her paper that endless questions can emerge from a multitude of perspectives as diverse as performer training to applied performance to cultural theory. An excellent panel all round. Denis Cryer-Lennon is a lecturer of theatre and drama, and research assistant, at the University of South Wales. He has been working as a theatre actor, director and writer for the last 17 years in Ireland and Wales. His key research interests include voice studies, actor and performer training, autobiographical performance, and storytelling. He is in the mid to late stages of his PhD entitled A Breath Pedagogy for Speaking Shakespeare: The Role of Breathing Work in Twentieth and Twenty-first Century Actor Training for Shakespeare’s Text. This entry was posted in Comebacks and tagged compassion, cultural cannibalism, Dana Blackstone, Flavia Domingues D’Avila, space, TaPRA, Who are we training for? by Denis Cryer-Lennon. Bookmark the permalink.